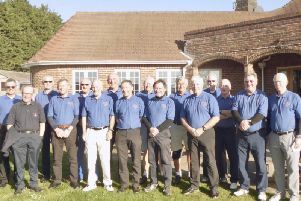 The Bognor spring seniors’ supper competition attracted 76 players, all playing to win the Bill Chick Salver. It is a four-ball better-ball Stableford, with pairs being drawn after dinner, the night before the competition. The course was in good condition following a reasonably wet winter and there were many scores over 40 points, which was terrific. Winners were Alan Simmonds and Bill Prior with an excellent 47 points. Second with 44 were John Samain and Chris Jenkinson and third with 42 on countback were Phil Lee and Brian Wolstencroft. Seniors captain Chris Hickling and Bill Chick presented the prizes, which went down to sixth place in reflecting the turnout. There were many thanks to Chick, now in his 25th year in organising the competition, and there was recognition of Ron Alcock, who passed away a month ago. He and Chick have organised the spring and autumn senior suppers. The autumn event is now named the Ron Alcock Salver. Cowdray ladies played in Easter Prize day and the weather was dry for most of the day. The event was organised by Terry Hughes and Imke Sanderson, the format being a drawn bowmaker – which two scores on par fives, three on par fours and all scores on par threes. There were eight teams of four and four teams of three. Each participant brought an unwrapped present, so everyone took home a prize. The best scores of the day were made by Marilyn Davis, Jo Fife, Rosie Jarrett and Sue Smith; Caroline Haynes, Gaynor Dudman, Jane Holden and Joy Reineck; and Ann Robertson, Marnie Evans, Wendy Street and Pauline Lamb.